We see only a small number of recognizable Turkman motifs in this asmalyk. The bold main border is generally found only on weavings from the Middle Ages. This asmalyk has perplexed many a Turkman scholar and due to its implacable nature has only rarely been commented upon in the literature. When seeing this enigmatic Turkoman asmalyk juxtaposed with a 17th century Mughal ‘fantastic animal’ carpet, one begins immediately peeling away at this mysteriousness. The Mughal carpet fragment, pictured in Hali Vol.4, #3; page 257, fig. 10, appears in an article written by Daniel S. Walker, now curator of Islamic art at the Metropolitan Museum of Art in New York City. The fantastic though somewhat linearized animal forms seen in this Mughal fragment appear to be directly related to the colorful zoomorphic forms decorating the field of this unique asmalyk. In the field of the asmuldyk we see paired animal like shapes drawn much like those of the ‘fantastic animals’ seen in the Mughal fragment. The highly stylized Turkman forms seem clearly derived from the more articulated Mughal archetypes. The animal forms pictured in the Mughal fragment shown in Mr. Walkers article appear to be both bilaterally reflected and transformed, with a large component obviously missing from its left side. In the field of the asmalyk, middle row of zoomorphic motifs, one sees opposed pairs of stylized Mughal animals representing spotted cats, with hind legs splayed out adjacent to their tails as if running. In the Mughal fragment one sees a much more elaborately drawn spotted cat whose general shape, especially the drawing of the cats hind legs and tail, is unmistakably related to those seen in the Turkmen asmalyk. It is precisely the similarity between the detailed representations of the juxtapositions of a running cats’ tail and legs that makes their connection obvious. The difference in the drawing of the cats’ shoulder silhouettes might indicate that the Mughal cat represented a running leopard while the Turkman example a galloping cheetah. The term for cheetah in Turkmen is “gechigaplan” (goat /tiger). The Turkman Khan’s were known to employ cheetah for hunting. I don’t think cheetah were ever native to Northern India but leopards certainly were. The only clearly Turkmen designs represented on this very old asmalyk are the four ashiks serving as terminal heads for the zoomorphic ‘animal trees’. Given the idea that some Turkmen weavings were reserved for special occasions or even possibly served as integral parts of Turkman cult worship, it’s interesting to speculate for which purpose this very unique asmaldyk might have once been used. A similarly enigmatic main carpet, collected by George Hewitt Myers and now housed at the Textile Museum in Washington, D.C., represents another Turkman weaving with obvious Mughal influences. 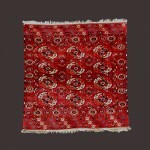 The Mughal prayer rug with flowering shrub has elements of design clearly discernable in the elem of the Myers carpet. In the pictures, we can see that the Mughal flowering tree has been modified to fit the relative scale of the Myer’s elems by removing the middle two flowers from its Mughal original. The shape and position of the leaves on the Turkman trees also seems visually related to those of the Mughal prototype. There is a line exiting the central topmost flower from both the yomud flowering plant and the Mughal example. In both examples there is also a design straddling this exiting line. These designs are very clearly related. The prayer arch is also retained in the Myers elem composition but vertically reflected so that it appears OVER the flowering trees and upside down. This last fact argues for simple copying as the most likely method of transmission between these two societies. One sees later renditions of the Myer’s elems but they are much more stylized; much bolder and more traditionally Turkmen. This is also true of the asmalyk as later renditions of its basic design are stylized to such a point that the animals are no longer discernable. Many of these later asmalyks have Turkoman jewelry motifs displayed across their tops. These later elem and asmalyk designs are also noticeably less curvilinear than their Mughal counterparts. While both Turkman weavings considered above are truly excellent and their designs especially pleasing, they were in no way able to capture the vitality and beauty Mughal weavers once had. There was an important Central Asian element in the formation of the civilization of Mughal India. Babar, from Afghanistan, defeated Lodi at Panipat, not far from Delhi, and so came to establish the Mughal Empire in 1526 in India. The culture of the Mughal Empire is seen to be a composite of indigenous and foreign elements, many of which originated, like the Mughal rulers themselves, in Central Asia. Many societies, such as the Turkmen, populating pre-colonial Asia should be studied in terms of their own self-perceptions, and not simply as backward projections of modern day realities and notions. It is in this light that I think the Myer’s Yomut main carpet and the enigmatic asmuldyk discussed above were unmistakably influenced by the Mughal aesthetic. Susan Day, from the Museum of Decorative Arts in Paris France, has stated that she believes the above described asmalyk is older than the 19th century and I agree with her. Considering that the knotting density, style, and ratio of vertical to horizontal knots in both Yomud weavings is identical, one can easily imagine they were woven at about the same time, possibly even by the same weavers. The Yomud first took complete control of Khiva in 1743 and though their fortunes there varied greatly, this would seem to have been a realistic time, politically, for the weaving of both these Turkmen masterpieces. In conclusion this paper highlights an occurrence of design migration from an outside though related society , the Mughals of India, into the corpus of several distinct lines of Yomud designs. This has ramifications for Turkmen studies in general. It demonstrates that the Turkmen did in fact assimilate outside designs into their own compositions and these incorporated designs became transformed through successive repetitions,e.g. generations into something new and different from their original inspiration. Pile: 2,400 symmetrical knots per dm2 in Z2 wool :(60 vertical x 40 horizontal), (150 knots per square inch). Good quality shiny wool, firm to touch, pile 4 mm thick. Variant: on the lateral sides, the last two rows of knots are strongly pulled to the left, unlike the rest of the carpet). Ends: at the bottom, traces of tapestry weave in Z2 brown-red wool; at the two upper edges, Z2 tapestry weave in three natural shades, folded and sewn under. Technical analysis provided by Susan Day. Warps: wool, ivory, 2 Z-yarns S-plied, warps even. Weft: wool, light brown, 2 Z-yarns S-plied, 2 shoots. Pile: wool, 2 Z-yarns; symmetrical knot. 10 hor. X 15 vert. Per inch (150 per sq. in. ), Some offset knots. Color: (8) aubergine, red, light blue, medium blue, blue-green, dark blue-green, brown and ivory. Finish: no original selvages or ends.